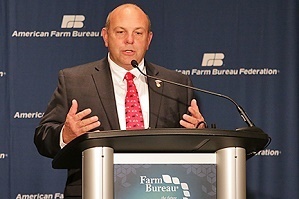 American Farm Bureau Federation (AFBF) President Zippy Duvall took office this month, saying at a news conference one of his main concerns is the protection of farm freedoms. Duvall warned that federal agencies, far removed from the farmers who respect the land they farm, are imposing unworkable regulations that ignore the rights and voiced concerns of farmers, including the overreacting actions with the Waters of the United States (WOTUS) rule. He noted that the courts and the Government Accountability Office have called on the Environmental Protection Agency to change the overreacting rule, but said it may take many years to get the matter resolved while farmers need to farm their land properly today. Duvall also told reporters that the advancements in technology have helped farmers to use fewer pesticides and to reduce the environmental footprint while still producing good quality crops. With emerging technology like drones and the CRISPR gene modification, he said the technology is limitless as to what it can do to help farmers. However, consumers need to be reassured that genetically modified organisms are safe, as proved by scientists, federal agencies and industry leaders, with facts. Finally, Duvall said technology is helping America to produce enough products to have the highest agricultural exports ever, which is also made possible by trade agreements that have gone extremely well. Some members of Congress and the president's administration are working to advance the Trans-Pacific Partnership trade agreement, which will open up more trade markets for the United States.